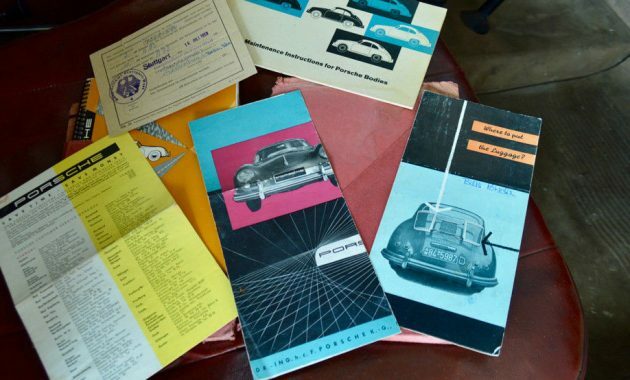 Even with the run-up in prices of the original Porsche 356, there are some examples that are likely worth every penny due to high levels of preservation. This 1958 356 “A” coupe is one of those cars, displaying many authentic in-period details and backed up by matching numbers from stem to stern. Find it here on eBay with an $87,500 Buy-It-Now. Everything about this bathtub Porsche is right: the faded paint, dulled hubcaps, black California plates, Porsche Club of America sticker and hood badge, the period luggage rack – it’s all there. 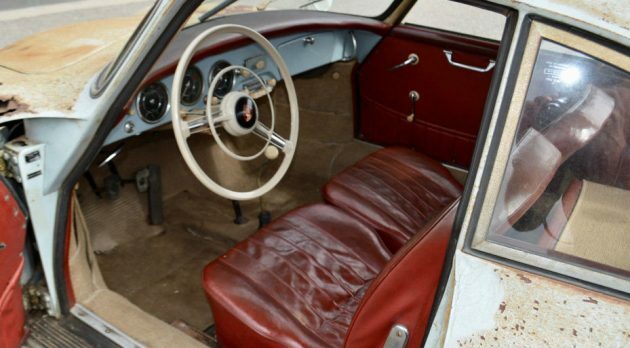 The seller notes that this particular 356 has been stored away since 1970, and was originally purchased as part of the company’s European delivery program, touring Europe before coming stateside. It even retains its original tourist program license plates. As if it couldn’t get any better, this 356 sports one of the more desirable interior colors available and it still presents well. Door panels look quite nice from what we can see, and the dash and steering wheel are seemingly in excellent shape. The seller notes that the engine and transmission are numbers matching, and even the correct date-coded wheels remain with the car – along with the factory tool kit and owner’s manuals. We love details like these. There’s even a brochure demonstrating the features of the engine lid-mounted luggage rack! 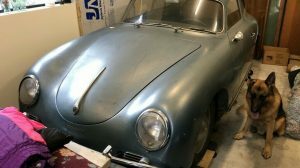 That’s some serious preservation, and our hat is off to the owner or owners who worked hard to keep these pieces intact and protect the 356 in its many years of dormancy. The price of entry is high, but these early 356s will always be desirable, and particularly in highly original form like this car. While not generally a fan, I really like the looks of this one. I’d be tempted to only do what’s necessary to stop further deterioration. WOW ! I’m a huge fan of the 356 in any form. I do hate to see prices where they are at simply because it jerks the feasibility out of the average enthusiast’s reach. The 356B Speedster is more to my liking but this one’s a peach ! If i were into Porsches, and had $90K to spend on vehicles, this would be the one! I would love to have 200k to dump into this one. 90k in and the rest for proper restoration. These are the only Porsche’s I’ve ever been into. The worst thing you could do to this is restore it. 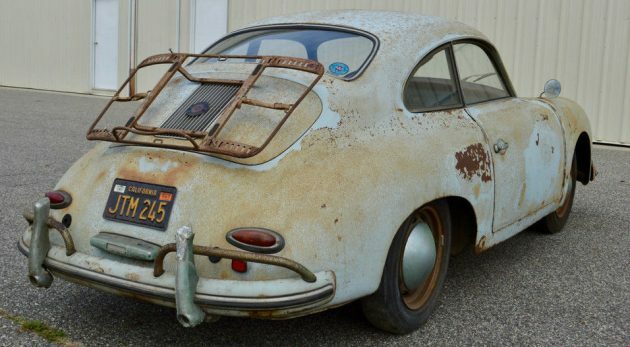 I have quite a few parts stashed away in totes for these…..I just don’t have the 356 to put them on ! :( The headlamp adjustment clocking even looks correct ! While not generally a fan, if I had $90K to spend on vehicles, it would be a Cayman! If I had 90K to spend I’d buy a used 911/997 Carrera S Cabriolet and tuck the extra 45K away for a rainy day!! Overvalued until I can see a pic of the underbelly. i was born in the same yr, and i look worse, seriously, just retard spoilage of original ingredients, bet it would be smart to find out how well pickled this is in trans and eng. it’s old enough to believe that it might need the case split, that’s fun hobbyist work on a real old bug, i’ve had a couple of those. are these just a 2 carb 1.3 bug motor…i really can’t tell. this car really is worth just what the market will bear, up to and including asking price, what a flashback…. Never really saw the attraction in these, much less justifying the cost. Porsche became a fantastic car, but I feel these are just glorified VW’s. I’ve never driven one or even sat in one, but from the laypersons point of view, I don’t see much difference, except the body, which isn’t very pleasing to look at. If I had $100g’s to spend on one car, it surely wouldn’t be this. Sorry. That’s really not why we drive them is it? Sorry Rube, but if you’ve never driven one, much less sat in one, then what’s your basis for calling a Porsche a glorified VW? I’ve owned a VW and currently own a 911/996 cabrio. Your statement doesn’t have validity. I’ve never driven or sat in a Mustang but it’s really just a glorified Lincoln town car, right? I have a ’04 VW R32, turbocharged and typically, Porsche drivers come over to take a look, they seem incredulous that a VW “golf” is able to pass them on the course. Sorry Don, I knew I’d upset someone, but to be clear, I said THESE cars are glorified VW’s, not the 911 and beyond, which are fantastic cars. In the future, make sure you have a legitimate gripe before getting so defensive. Sorry, but if you’ve never driven one, you have no idea what you are talking about. I just dont get/the prices these bring. 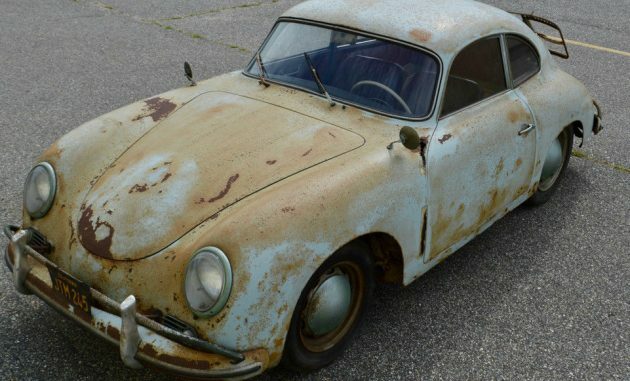 Pretty good for an old 356….seems very original and complete. I keep expecting not to see any more like this because they must have all been found and restored or preserved. But they still keep coming. Is this a preservation candidate? I suppose someone could try to clean up what’s left of the paint, but the real problems are manifiold, and I don’t mean the kind that carbs sit on. #1 is rust, of which there is plenty in this car. Other than the surface rust that’s on every panel, the real giveaway is the vertical line of perforation at the rear of both front fenders. The car spent time on the East coast, so no surprise there. #2 is the absence of any underside photos. See #1 & 2 above. #4 is the statement that ” The engine, gearbox and just about everything is completely numbers matching…”, but none of those numbers are given in the listing. It’s hard for me to see a reason for withholding those numbers in an ad, given the very strong claims about the car. I could be wrong, and I frequently am, but when I see this approach I get the feeling thet the seller just wants to carry on with the hard sell on the phone….on my time and dime. Why not give the information up front? Auctions do that. Dolphin see my website for lots of images, documentation and complete transparency. No hard sell here. I think this is one of those cars that I started to think was so cool because so many enthusiasts kept gushing about how great it was. It made me believe it. But now I look closely at it for what it really is and think, “Nah, not that cool really”. At the time this car came out it was winning everything. Everything. 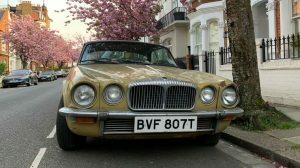 Why does someone desire any vintage car? In 1961, I had a ‘56 356 A , 1500GS Carrera. Like a fool, I sold it two years later for $2500! WAY TOO MUCH MONEY! And I always liked these. I’ve watched these cars go through the ceiling in monetary value and it’s just not realistic. Restoration here certainly North of $100,000 with correct paint and so on, apart from what the suspension needs and so on. The color of the dash is the exterior color of the car. I agree with the folks commenting; I’d put the money elsewhere. Buy a 912 (don’t laugh) and have a good time for half or less of the total cost o the project. Ever driven one? they drive like a truck,handle terribly and you want out after 20 miles. When I was in college in the early 70’s, my neighbor had (I think) a ’55 with a sunroof. He had been working on it one day when I came home, and he said let’s take a drive. Away we went, ‘flying’ down the highway, when the metal sunroof flew up off the roof, and went sliding down the road. By the time we turned around, a truck had run over the corner of it. It wasn’t bad, and he was able to straighten it out. He said that he had been working on the sunroof and forgot that he hadn’t bolted it down. My only ride in a Porsche. Same/similar thing happened to me, when we were flatbed towing my new to me 1958 220SE Coupé. They only made about 1500 of these cars and I have yet to find a matching replacement roof. The previous owner forgot to mention that he had taken out the sunroof and just placed it in the spot when i picked it up …. For that kind of money I’d buy a Tatra 600 before a 356 . Sorry guys .It dosen’t rock my world. This car is beautiful in that it represents the early expressions of the genius of Ferdinand Porsche and the incredible legacy of courage and quality that was to follow into the present and future. The fact that it sits there in it’s whole original unmodified glory is really amazing. 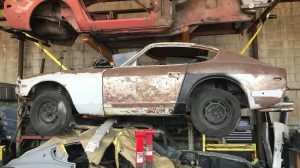 I agree with the poster that states that the worst thing would be to restore it, but that is obviously what the seller is banking on with that price. 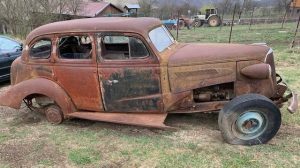 This car will be restored. I wish I could own it and drive it every day just as it looks now. Beautiful forever. Had 2 of these. ..a 55 & a 56. Bought the 55 when I was in college (1963) for around $1500 . Drove that puppy across the US after graduation to LA where Prez Prado the band leader T-boned it and totaled it. Bought a friend’s 56 when he did the euro buy and tour in new 912. 2 years later it too was T-boned when a kid ran stop sign. Hey Rube, I wasn’t insulted or defensive. I called into question your logic. That’s all. And it doesn’t matter whether you were referring to this one or a future one, I still don’t understand how you can pass judgement on a car you’ve neither sat in or driven. But that’s what’s so cool about this country, we all get to have our opinion. Peace. That’s awesome! Hopefully it went to one of our readers!